A B.C. event promoter wants to bring thousands of bikers to a motorcycle rally in the North Okanagan this July, including the Hells Angels. A B.C. event promoter wants to bring thousands of bikers, including the Hells Angels, to a motorcycle rally in the North Okanagan this July. Sturgis North brought as many as 40,000 bikers to Salmon Arm, B.C., last summer. This year promoter Ray Sasseville expects the motorcycle rally and rock festival will draw even more people, and is moving it to the Motoplex Speedway race track near Vernon. "I will make it successful. The motorcycle community is very strong," said Sasseville. Members of the Hells Angels bike gang were at the five-day festival last summer, some of them selling their branded merchandise. And members are welcome to return, said Sasseville. "They are part of the motorcycle community and we don't want to be segregating," said Sasseville. 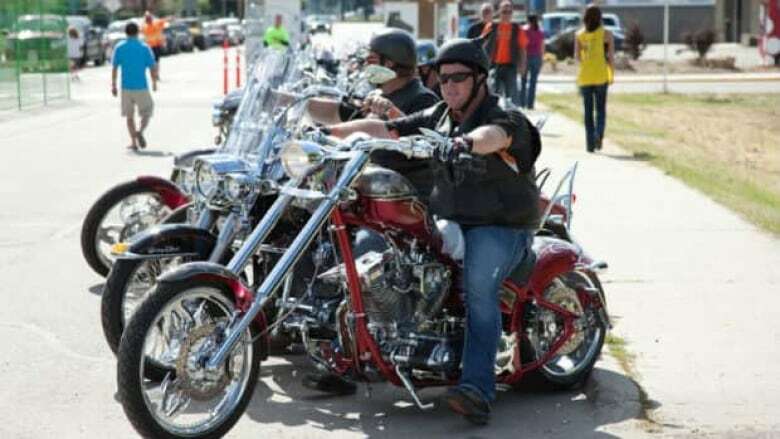 Vernon mayor Rob Sawatzky said he's surprised to learn Sturgis North is moving to a venue on the outskirts of his city and has concerns about the presence of the notorious biker gang. "My understanding, and I could be wrong, is that Hells Angels are an established criminal organization. So that would lead most people to have some concern," said Sawatzky. Sawatzky said he's not against the festival in itself, as long as everyone rolling through his community behaves. "If they're law abiding citizens, we'd be happy to have them and welcome them. But if they are troublemakers and if they break the law that would be troublesome and worrisome," said Sawatzky. Last year's Sturgis North festival lost money; Sasseville currently owes more than $200,000 to creditors in Salmon Arm. He says the new venue and better facilities will lower his overhead costs, and ultimately make him enough money to pay off those bills.